Let me just say that I’m not exactly sure what FDR was thinking when he said we have nothing to fear but fear itself. Really? There are a lot of things to be afraid of besides fear. In fact, fear is super useful. It’s the thing that kept our ancestors from playing with poisonous snakes. It’s the thing that keeps us from climbing the fence at the Grand Canyon for a better look. And it’s the thing that would cause most people to walk right out if they found themselves caught in a boxing ring with a boxer coming at them with flying fists. Fear has kept the human race from going extinct for 200,000 years. It may be one of the greatest evolutionary adaptations of all time. But sometimes that which was meant to preserve life gets in the way of really being alive. These past few days, boxing has introduced me to fear in a new way. I’m not talking about the fear that we are all familiar with on a daily basis: the fear that we might lose our job, that our kids might get sick, that our partner might leave. I’m talking about life and death fear. Not fear of the thing that could possibly happen but the fear of the thing that is definitely happening right now in this very moment. The type of fear that sends 30+ hormones surging through your body in a split to get you ready to fight for your life or to get the f*** out of there. Primal fear. The thing an antelope experiences when it finds itself surrounded by a pride of lions. Fear that is not a feeling at all so much as a physical sensation. That is the fear I met in the boxing ring yesterday. Allow me to digress: I failed to realize that losing at boxing is not at all like losing at other things. I’ve lost at a lot of things: games, competitions, you name it. I like to think that I’m an expert loser by now. But nothing compares to losing at boxing. In most sports, losing means you go home disappointed. Maybe you’re angry because the ref made a bad call and you lost the game. Maybe you feel really crappy because losing that game means you don’t move on to the finals. But in boxing, losing means you’ve been physically beaten. It means your life was in danger and you couldn’t stop the threat. Maybe this was obvious to everyone else, but yesterday it came as a surprise to me. I wasn’t beaten to a pulp, nor was I even knocked down, but my sparring partner laid some combinations on me that definitely did some damage, and it was clear that if anyone should be declared a winner, it wasn’t me. The sensation that came after our 6th round was what surprised me. I had anticipated a sense of defeat, disappointment with myself, or frustration the first time I got creamed in boxing—all of the things I normally feel after losing. I felt none of these. What I felt was purely physical—the feeling you have the second after you narrowly escape a deadly car crash. I wanted to cry and collapse on the mat, not because I’d lost, but because I had just fought for my life. Now, I know that my trainer is not going to let me die, or even be seriously injured, in the ring. However, I doubt my body has anything more than a vague appreciation of this as it’s being accosted by another human being. So, recognizing the threat, my body sends an urgent message to my brain that it’s under attack, and a fantastic number of things happen in a fraction of a second to help me survive. My brain tells my sympathetic nervous system (the thing that regulates my internal organs) that it’s go time. My sympathetic nervous system in turn sends out other signals and releases adrenaline, a chemical that gets my heart racing and raises my blood pressure. There’s some more back and forth between my brain and body, ultimately causing the release of a myriad of hormones. These hormones cause my pupils to dilate so my eyes let in as much light as possible, they make most of my muscles tense up to get me ready to fight or flee, but relax the little muscles that contract my blood vessels in order for my lungs to take in more oxygen, they shut down nonessential processes in my body like food digestion so that all the energy in my body goes to the survival strategy, and they make it nearly impossible for me to focus on anything except the boxer beating on me. If you think for a moment about how much happens in just milliseconds of a perceived threat to completely change the chemistry of your body, it’s absolutely incredible. Pardon me, my geeky science nerd side just got the better of me for a minute there. Back to boxing. All those chemical changes are what cause that primal fear feeling we’ve all experienced at one time or another and that I sensed in the ring yesterday. Since then, I’ve been thinking a lot about fear. I have no doubt whatsoever that I’ll get back in the ring. In fact, if my nose wasn’t still so sore today, I’d find someone to spar with this morning. But why do I do this to myself? This question was at the forefront of my mind in the ring yesterday. Why voluntarily subject myself fear and pain? I mean, even in the ring, I could have avoided such physical abuse. As we’ve already established, I’m a decent runner, and running around the ring for 3 minutes is child’s play compared to running 26.2 miles. But the thing is, if you’re just going to dance around the ring, keeping a comfortable space between you and your opponent, you may as well just get out of the ring. Find a different sport (I think this is when most people say, “well, duh. Thanks, I will”). But there is a thrill being in the ring that I can’t really describe. It is the feeling of being really alive. It is the feeling of crazy, passionate, risk-it-all love. It is going all in and burning the bridges behind you. It is like anything that is really worth doing—you do it in spite of all your fears. You do it even though the instinct of self-preservation says to do the opposite. You come in close to play the game, knowing full well that coming close means you’ll get hit. You hope it’s not too hard, and you hope you can defend it when it comes, but you know it’s coming. And even though at the sound of the bell, you may be battered, bruised, and exhausted beyond belief, you get back up and go in for another round. These days, I eat, sleep, and breathe boxing. The problem with sleeping boxing is that it results in some violent sleep habits. So far, there have been no casualties, but I do a lot of twitching as I go to sleep running through a combination in my head or envisioning slipping a jab. I’m not the only boxer who does this apparently. I’ve heard of other boxers hitting in their sleep. I hope for my partner’s sake and mine that it doesn’t come to this. I may become good friends with the futon pretty soon. I’m currently envisioning striking with one hand at a time because, evidently, in boxing two hands are not better than one. I have a tendency to superman it at my opponent, which is not ideal for me in so many ways. First of all, I don’t get a solid blow using the superman technique. In spite of what you might think, hitting with one hand is a lot more effective than hitting with two hands at the same time. Another problem is that it means I’m off balance and no longer in fighting stance because I’m leaping at my opponent like a jaguar. Since biting in boxing was outlawed in 1838, and the closest things I have to claws are covered with gloves, I probably should not be fighting like a jaguar. Lastly, with both hands out, my face is wide open for abuse. My sparring partner has picked up on this, leaving my nose a little sore as of late. So I’m focusing on keeping one hand at my face at all times and throwing measured, relaxed, hard blows. My trainer said this morning that it’s looking a little better—I’m not doing the superman every time. Hey, it’s a start. One of the founders of Haymakers for Hope stopped by the gym this morning to watch our training. I was totally flattered because, after seeing me spar, she said that I have the things you can’t teach—timing and fearlessness. I imagine my fearlessness may come from growing up with an older brother. Since he’s a few years older, throwing punches usually ended badly for me; I’d typically end up lying on the floor paralyzed from tickling with both my hands trapped in one of his. But he broke me in for boxing all the same. All the whirlies are finally paying off. I’d like to say that playing the harp since the age of seven helped develop my sense of timing, but those two activities seem so drastically different it might be a stretch to connect the two. In at least one respect though, playing the harp is just like boxing. When playing an instrument, you have to be willing to do the same thing over and over and over again until it feels like you were born doing it. You repeat it slowly and flawlessly until your muscles remember exactly what to do—until you do it without thinking. Only then do you pick it up. If you don’t have it, you slow it down again. Then when it’s time to perform or when you step into the ring, even if your mind is losing it worrying about this and that, your body does exactly what it is supposed to do. So I practice the same things over and over. Every day: one-two, one-two, one-two, one-one-two like meditation. One-hand-at a-time. One-two. And in this way, some day I’ll be a boxer. Many people have asked me “why boxing?” or, as one friend put it, why as a runner, did I go from flight to fight? Others have commented that getting hit repeatedly doesn’t sound like fun (though truth be told, I got that comment about running 26 miles too). Some people simply said “yikes!” And my mom said, “well, at least you didn’t rob a bank.” I guess I know what the line is now. But why am I doing this anyway? Why do I love boxing? Before I started boxing, I never watched boxing, I never thought about boxing, and I certainly never considered boxing myself. I never had the slightest desire to hit anyone or be hit by anyone. I considered myself lucky to have gone through life without ever being hit in the face. I didn’t want to try boxing because I knew I wouldn’t like it. Sometimes we surprise ourselves though. 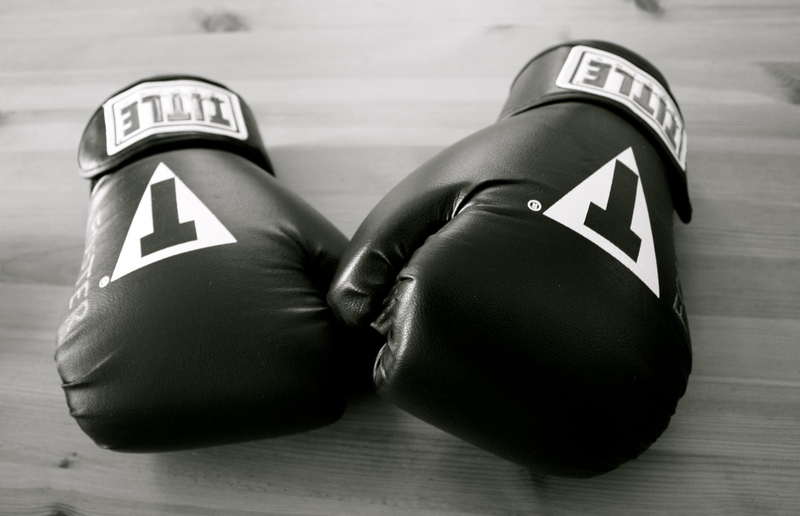 As it turns out, boxing is so much more than hitting and trying not to get hit. I never understood the technical skill that boxing requires, and I was immediately attracted to the challenge. Learning the basics has been just that. My body is still learning how to move like a boxer. My hips don’t turn enough, I don’t extend my arm when I take a shot, I lunge forward rather than stepping with control, I move clumsily around the ring or sometimes I forget to move altogether and stand like a deer in the headlights. The list goes on and on. In the beginning, I had to think about every move. I’d focus on fixing one thing and something else would go because I wasn’t thinking about it. It was so much to think about. I’d like to say that now I don’t have to think anymore, but I’m still learning the basics. I’m still drilling and drilling the same things. The first thing you learn in boxing is how to throw a jab and a cross (left hand then right hand), the source of the idiom “the old one-two.” Guess what I worked on yesterday? The old one-two. Slowly things are becoming more natural though. Occasionally, my body does exactly what it’s supposed to do without me having to tell it what to do. With mastering the basics though comes a new challenge, which is trying to do the basics with someone simultaneously trying to hit you and deflecting your punches. This is my current problem. I think I’d be a pretty decent boxer if only my opponent had fewer than two arms. Unfortunately, I think having all four limbs may be a pre-requisite for boxing, since most of the boxers I know appear to have a full set. I get in a solid blow every once in a while, but most of my time I spend thinking, “Now? Should I go now? No, too late. How about now? What am I supposed to do when she’s just wailing on me like this? Oh look, I have a clear shot to her head, maybe I should take it. Do I have to uncover my face to do that?” What makes me happiest now—even when it doesn’t mean I get in a real hit—is when I feel hints of the next level: the dance. In my first weeks boxing, someone (a dancer) told me that boxing is like dancing. This is a true statement, and the more I box, the more I find it’s true. Boxing is this complex balance of reading what your opponent is going to do and responding to it, while still staying in control of the dance. You take what she gives you, but at the same time you want to force her to give you what you want. If she’s throwing a fist at you, some part of her body is vulnerable. It’s your job to find that spot. You move in, you move out. You follow her, she follows you. Yesterday I had one moment where I felt like everything aligned, I felt the rhythm of the dance, and my body did what I wanted it to do. One of the boxers told me that when my opponent throws a cross, I should go for a cross to the body. This not only gets my head out of the way of my opponent’s fist, but while her right hand is extended, her body is exposed allowing me to get in a hit. I was fumbling around the ring trying not to get too beat up too badly when the opportunity came, I saw it, and I took it. It was the best moment of the day. I’d like to say that she doubled over from the blow, but actually, I’m not sure she felt it. I was so focused on taking the shot, I failed to put much force behind it. But anyway, it’s a step in the right direction. In the end though, I can’t really say why boxing. I love the physical challenge and mastering a new skill, but there certainly are other places I could find that. I like that it makes me feel pretty badass. But I think the thing that draws me to boxing is the rawness of it, the brutality. There is something gritty and terrifying and exhilarating about being in the ring with someone. It’s a sport that is primal and ancient. It sparks something deep within me, something I hide in the shadows because it’s not proper and it’s not polite, something hard-wired into my being: the fight.